This little centerpiece stone sat for years patiently waiting for me to make something with it. I'd pick it up and admire its pretty shape and fascinating inclusions, fall in love with it all over again, but then fret that perhaps no one would like its subtle colors. It was interesting that a fellow artist at the last show chose it to wear one day-- often other vendors oblige me and wear my work. She started to take her lovely choker with its small neutral stone off but I suggested she wear both pieces. She was wearing a nice suit with an ivory blouse and the two pieces worked very well with her outfit. I noticed her gazing into the stone on more than one occasion, apparently as entranced with it as I. Perhaps you will find yourself doing the same when you wear it. Marcasite: we think we know you! Our grandparents and great-grandparents had wonderful "Marcasite" jewelry which was actually Pyrite else the bright little stones would have long since self-destructed into iron-sulfate and sulfuric acid. We have discussed this before: "Marcasite" is chemically closely related to the more stable Pyrite and its use as a general name for iron sulfides was used in jewelry terminology before the modern scientific distinction between the varieties was established in 1845. True Marcasite becomes unstable only when it reacts with moisture and oxygen in the air but it is protected when encased in agate. 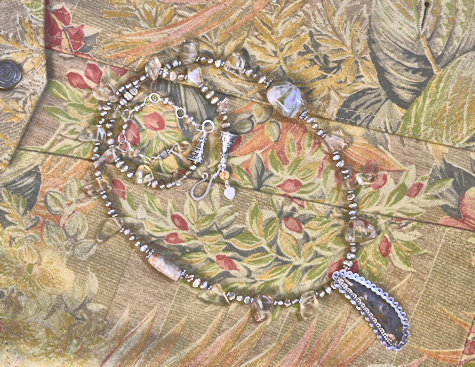 In Agates II Zenz discusses the Marcasite in Nipomo and in Graveyard Point Idaho Plume agates. 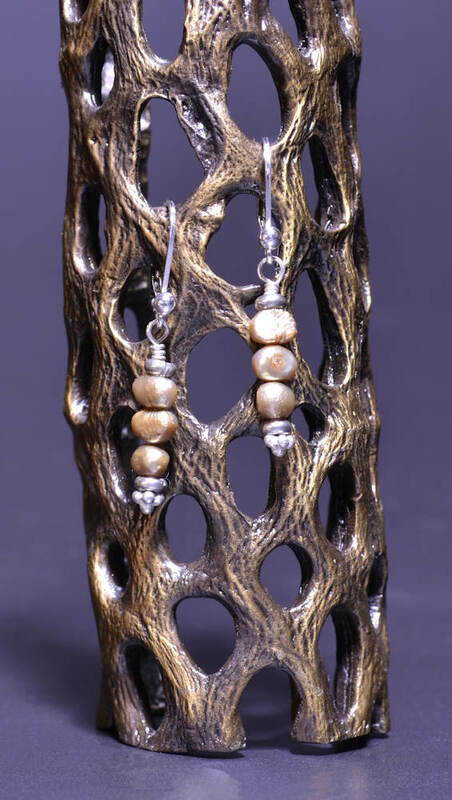 He says Pyrite is encased in chalcedony and is therefore in place before banding occurs. He also says that Marcasite can form as distinct plumes on the walls of a vein, when the vein is later inundated with a silica gel, sagenitic needles can grow in the gel so you can find the plumes and the sagenite combined. In Agates III he has a whole chapter on "Paragenetic minerals in agates" including Marcasite. 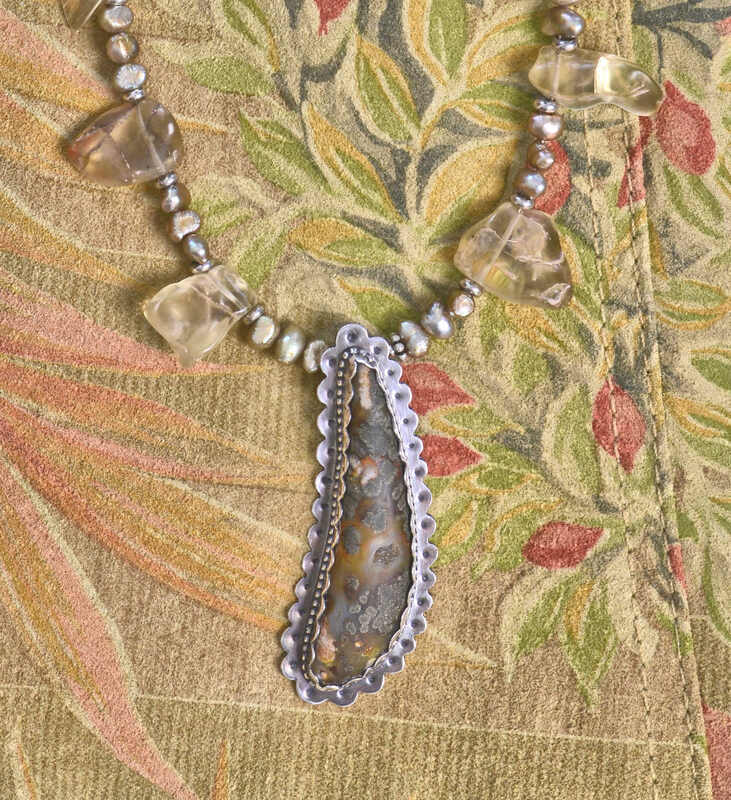 So it is clear that with the protection of the agate, you can have piece of actual Marcasite jewelry! Our little stone also has a tiny crystal pocket, or fairy cave as I prefer to call such features. It is astonishing to me that lapidaries used to cut around pockets like this to avoid them, can you imagine? To me they make the stone ever so much more fascinating. 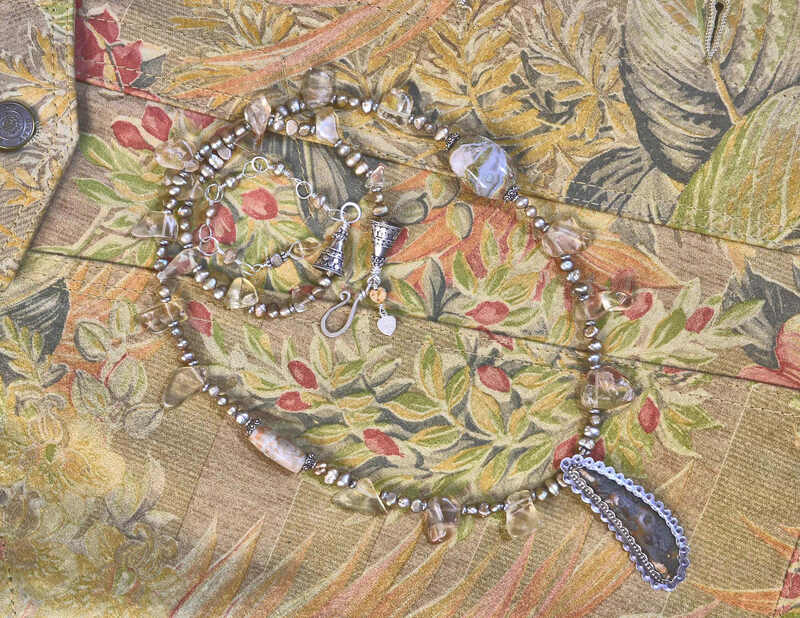 I donated one of my precious Thunder Eggs to this necklace-- you may remember when I scored an amazing strand of these fellows and I've been reserving them for very special pieces ever since. The eggs are quite variable, and this one seemed to blend with the centerpiece perfectly. And imagine wearing an egg spawned by Thunder! 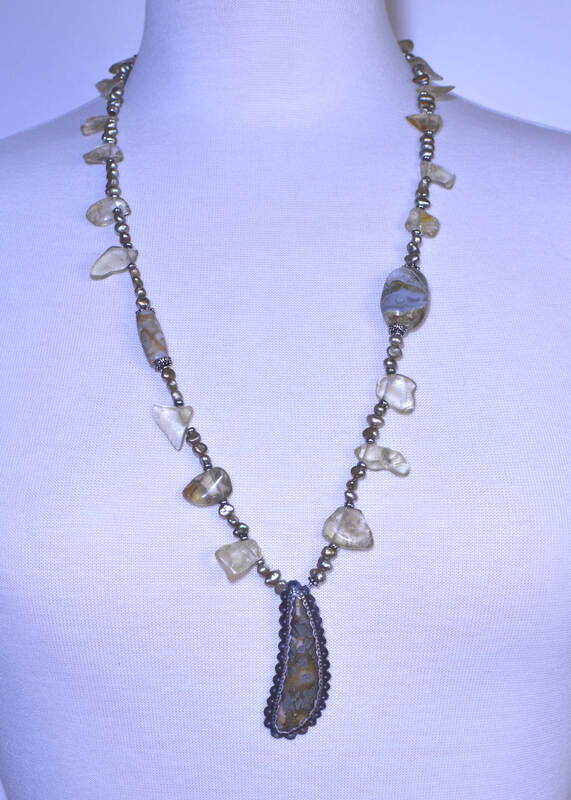 The roughly triangular clear yellow crystals in the necklace are yellow Labradorite. They don't display the labradorescent play of color one associates with Labradorite, but are very pretty accents for the centerpiece. Please order this set today and enjoy wearing it with everything while you listen to its many stories.